An alternative to the gold-plated visor was developed in the form of a gold-plated lens for the well-known B-8 or M-1944 goggles. These could be worn when needed and otherwise tucked away in their protective box. According to PACAF regulations this modification goggle kits are used in multiplace aircraft where they are stored on board and distributed as required. 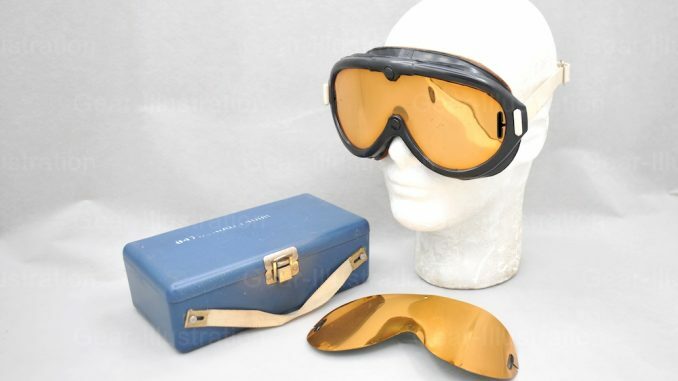 The conversation kit consists of a gold-plated visor, a set of elastic strap and a monocular eyeshield, can convert a normal M-1944 Goggle or Sand, Wind and Dust Goggle (SWDG) into a nuclear flash blindness goggle, and can be wore alone or attached to flight helmet like HGU-9/P. Used by Strategic Air Command (SAC) Bomber crews.